KH Buffer– an agent to maintain constant carbonate hardness in coral reef aquaria. Dissolve 80g of the product in 1000ml of deionized water. To maintain ion stability, use Calcium, Magnesium and Reef Mineral Salt Aquaforest products as well. 10g KH Buffer increases by about 3,3 dKH ( Alk. 1,18meg/l) in 100L . 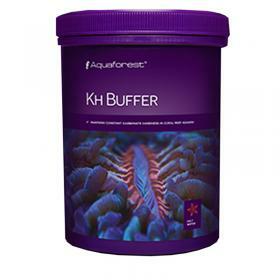 The recommended KH level in coral reef aquaria is 6.5°- 8.0°dKH. Contains NaHCO3.